My niece eats roaches… live ones… and more than one in a row!! Eeeewwww! Being that I work from home, I have the luxury of rarely needing an alarm clock. Recently, I have noticed that if I sleep too long one day, the next day I will often sleep less. Over the course of a week, it all balances out so that I typically get 8.5 hours of sleep a night. Yesterday, I slept in, having had approximately 9.5 hours. But here I am today at 5AM having had only about 6 hours worth of sleep last night. I’ve read several times that one can’t actually “bank” sleep in advance. And yet, that seems to be what is going on here. Or perhaps it is insomnia of some other sort and I just don’t see the pattern correctly. It is also interesting to note that the days where I “sleep in” are extraordinarily productive and creative. I know that sounds counter-intuitive, but I have more than a few pieces of anecdotal evidence. For example: yesterday, I created a detailed, 12-point IT Risk Area framework (from scratch) that will serve as the basis for a new business venture. Is it possible that the extra sleep allowed the ideas to percolate in such a way that I had extra clarity upon rising? In case you are wondering, I didn’t actually purchase or consume any of these products. But I just don’t recall this kind of unusual stuff being so ubiquitous in my youth. I am convinced that this exponential availability of choice is driven by a large population of novelty-addicted customers and negligible distribution costs, resulting in some Long Tail-inspired retail practices. Perhaps I am a bad consumer. But I also think that there is something to be said for not going too far out on that Long Tail. I don’t want to get so addicted to novelty that I can no longer appreciate the fundamentals. As mentioned, I went out of town last week. When I came back to San Diego late at night on Thursday, I noticed a funny smell in my apartment. I thought: I’ll deal with it tomorrow. So I went to bed. Upon waking, with a slightly sore throat, I started to investigate the source of the smell. Turns out, the source of the smell was black mold in the office closet, lots of mildew on the baseboards, drywall, and crown moulding, and green mold growing out of my carpet. Uh oh! I called the Property Management company. They are working with the building HOA to have the mildew remediated. But this “remediation” effort won’t be easy, painless, or fast. It will probably take a month, result in the loss of use of my office, and mean that all the furniture and stuff that was stored in that closet will need to be smushed into the rest of the apartment. And, of course, there are all the workers that will need to get into and out of my apartment. I get the pleasure of coordinating that while I sit around the apartment sucking air from a loud hepa-filter. I am currently waiting to hear from the management company to determine what sort of rent-reduction plan they offer. I have my own ideas about this situation & what they need to do to make me comfortable. Can we say free rent? Really, now… you must admit that my string of unfortunate events is rather humorous when taken as a whole batch. But I’m keeping my chin up! While in Bentonville, Arkansas, I was able to try archery with my friend and associate Suraya. Turns out, I’m a good shot! 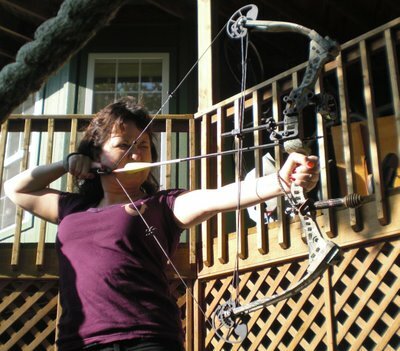 Here’s a photo of me with bow and arrow. In case you didn’t know, I’m a bit of a Trekkie. I haven’t been to a convention, but I think it would be fun to go. I would totally enjoy dressing as an Andorian — they’re the blue ones with the antennae. Mostly, I like the more modern versions of the franchise. But you have to admit that both the original series and TNG are looking pretty dated right about now. The new Star Trek movie is AWESOME. I really, really like this twist on the franchise. I hope that they make a bunch more movies and TV shows now that they’ve introduced this alternate reality. OK. So the biopsy report came back. No cancer! And I bought a replacement computer. So that’s taken care of. Workstuff is getting good too. I think I’ve turned the corner. Life is looking really, really good now. My Macbook Air laptop was stolen. I still have my old laptop (Tonto)… but there is a reason that I bought the Macbook and that reason hasn’t evaporated. So I’ll probably need to go out and replace the stolen computer. I seem to be going through a streak of bad luck that is testing me like Job. You are currently browsing the Lura.net Blog archives for May, 2009.